DigiPub’s Sue Brown catches up with Edwin Hill as he promotes his new book, Little Comfort. In this interview, Hill shares the celebrates the effort of a successful book launch: the first in his well-received Hester Thursby mystery series. Hill digs into his experience with his first book, explaining how he navigated the publishing marketplace to successfully land a multi-book contract. Hill talks about what he learned about the editing process from his day-job experience as editorial director and vice president at a major academic publisher. His business-like approach to writing and marketing his book, offers concrete advice to any writer negotiating the publishing business. In this episode, DigiPub’s Sue Brown talks with the award-winning indie magazine entrepreneur, Karen Covey, about The Coastal Table. In Covey’s words, “The Coastal Table is a quarterly celebration of the diverse stories that define the special nature of everyday life on the coast.” In this interview, Covey details the vision for her business, and how she uses print, digital, and social media to create unique experiences that attract a highly engaged audience. 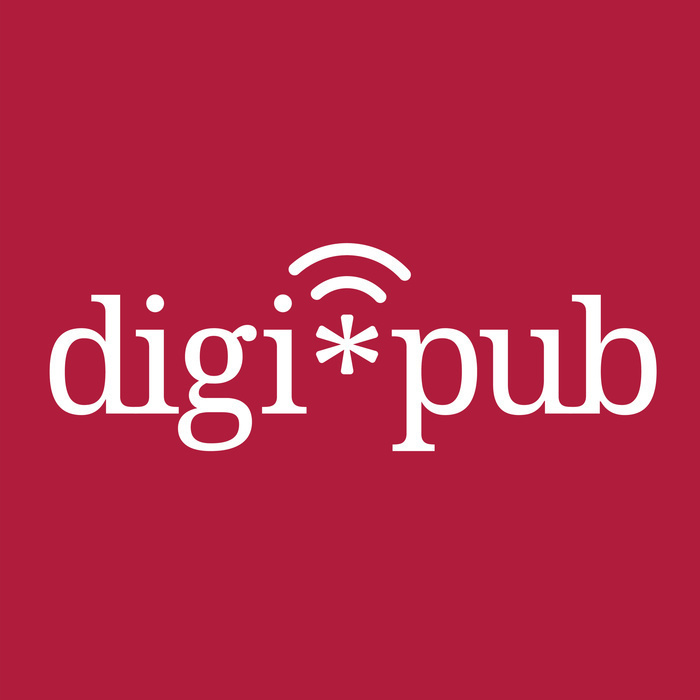 In this wide-ranging interview, Digi*Pub host Jack Cashman talks with Tim O’Reilly of O’Reilly Media about how publishers should think strategically in the face of digital disruption and about the platform dynamic of publishing as a whole. The discussion touches on DRM, Open Source, subscription versus ad based models, and other publishing models on the Internet. Then they dive into some of the ideas that Tim writes about in his book, WTF: What’s the Future and Why It’s Up to Us, and discuss how we have a collective choice on how we think about and how we use technology and what the next wave of innovation should look like. In the post-interview panel discussion, Jack is joined by Sue Brown, of Macmillan Learning, Laura Linnaeus, of Macmillan Learning, and Denis Saulnier, of Harvard Business Publishing; they talk about the idea of publishing as a platform and the need to create value for both the creator and consumer and wonder about what comes next. Mobile, web, print. Readers want to read in multiple modalities. Meeting readers where they want to experience content is one aspect of publishing’s “digital transformation.” Challenges such as cost control and speed to market lead publishers to digital transformation in operations. How can do content management solutions drive faster digital transformation, and set the stage for innovation? Why is reinventing workflow so important to digital transformation? How can publishers drive the most value from their service providers? In this episode, DigiPub host Sue Brown talks with Ixxus’ Steffanie Ness about specific steps publishers can take to achieve digital transformation -- and satisfy the need for product innovation while achieving operational savings. In the post-interview panel discussion, Sue is joined by Jack Cashman, of the Harvard Alumni Association, Laura Linnaeus, of Macmillan Learning, and Denis Saulnier, of Harvard Business Publishing; they talk about the learner audience and the influence technologies may have on the learning experience. From academia to custom educational publishing to MOOCs to paid online programs, Stefan has seen it all. DigiPub host Laura Linnaeus talks with Stefan Esposito, Program Director for the Harvard Business Analytics Program (HBAP) and former Fellow and Manager of Instructional Development for HarvardX, about effective learning, the price of an online education, retention, and the sea of data that encompasses it all. In the post-interview panel discussion, Laura is joined by Denis Saulnier of Harvard Business Publishing, Jack Cashman of the Harvard Alumni Association, and Sue Brown of Macmillan Learning who engage in a brief panel reaction to the interview, including how it resonated with their various endeavors in publishing. 2.5 | Defining Fair Use with Kyle Courtney: What Is It and How Do We Use It? Fair use is a complicated topic for publishers, full of myths and misunderstandings, but it’s a crucial concept for publishers to understand in a fast-changing digital world. Digipub host Jack Cashman talks to Kyle Courtney, Copyright Advisor for Harvard University, who breaks down what exactly Fair Use is, how to define it, how to use it, and how to defend it. In the process, he busts a few Fair Use myths that won’t seem to die and reminds us that it’s safe to sing the Happy Birthday song again. In the post-interview panel discussion, Jack is joined by Denis Saulnier of Harvard Business Publishing, Laura Linnaeus of Macmillan Learning, and Sue Brown of Macmillan Learning who engage in a brief panel reaction to the interview to discuss how they’ve managed fair use and copyright issues in the past. Are digital media companies publishing companies? Why do some companies shy away from the terms? How useful is a degree in publishing anyways? To find out, DigiPub host Laura Linnaeus talks with Vanessa Golembewski, Writer/Producer at NBCUniversal, comedian, and Moth storyteller. Vanessa takes us on the journey through her career from textbook editorial assistant to video producer to comedy writer. She tells us about what it was like to serve as the face of her brand at Refinery29, how she ended up starring in some surprising places, how gender proportions affected her career, and how some surprising content went viral. In the post-interview panel discussion, Laura is joined by Denis Saulnier of Harvard Business Publishing, Jack Cashman of the Harvard Alumni Association, and Sue Brown of Macmillan Learning who engage in a brief panel reaction to the interview, including how it resonated with their various endeavors in publishing. What can publishing production and editorial functions learn from how software developers work? Software engineers work all day with text, and often collaborate in ways that require intuitive yet powerful methods of collaboration and version control -- all traits they share in common with many aspects of the traditional publishing content workflow. DigiPub host Denis Saulnier gets insights on this from Andrew Savikas, former CEO of Safari and former O’Reilly executive who ran the Tools of Change for Publishing conferences. Andrew gives an overview of how these tools work and the value they bring to the publishing process, and also gives specific tool recommendations for publishing professionals interested in experimenting with them. In the post-interview panel discussion, Denis is joined by Sue Brown of Macmillan Learning, Jack Cashman of the Harvard Alumni Association, and Laura Linnaeus of Macmillan Learning, who engage in a brief panel reaction to the interview, including how it resonated with their various endeavors in publishing. Designing online courses to accommodate personalized learning pathways is more possible using educational technologies. But how do publishers and instructors ensure these learning experiences are engaging and accessible? How does technology’s much-needed disruption to education balance against practical concerns of ensuring strong learner outcomes? What contributions do instructional designers and learning scientists make when implementing digital tools into the learning experience? DigiPub host Sue Brown had the opportunity to consider these questions while at LearnLaunch’s 2018 Across Boundaries Conference, This episode brings you two of those conversations with learning design practitioners as well as education visionaries. First, Jennifer Rafferty and Elisabeth Stucklen, of the Online Learning Consortium discuss instructional design, the OSCQR rubric, and the OLC’s Workshops. In the second part of this episode, Michael Horn shares his perspectives among many things, the importance of quality content to support learner-centered educational experiences. In the post-interview panel discussion, Sue is joined by Jack Cashman, of the Harvard Alumni Association, Laura Linnaeus, of Macmillan Learning, and Denis Saulnier, of Harvard Business Publishing; they talk about the learner audience and the influence technologies may have on the learning experience. Pressures to bring affordability and relevance to education are driving fascinating innovation within educational publishing. Open education resources promise affordability. Personalized learning experiences promise relevance. Authentic assessments promise an accurate measure of competence. These trends are made possible by developments in AI. How exactly does this technology underpin these important developments in education? Does AI technology improve the content curation, educator, and learner experiences? What is the interplay between content and AI? DigiPub host Sue Brown of Macmillan Learning met with several edTech innovators at LearnLaunch’s 2018 Across Boundaries Conference to turn over these questions. This episode features conversations with Paul Crockett, of Authess, Andrew Magliozzi, of AdmitHub, and Dr. Eleni Miltsakaki, of Choosito. In the post-interview panel discussion, Sue is joined by Jack Cashman, of the Harvard Alumni Association, Laura Linnaeus, of Macmillan Learning, and Denis Saulnier, of Harvard Business Publishing; they talk about the learner audience and the influence technologies may have on the learning experience.